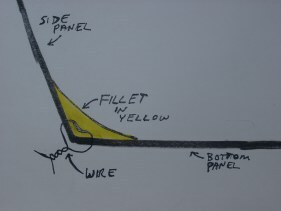 What, you may ask, is "filleting"? Well it is a verb I made up that means "making fillets." Still confused? Well, fillets (pronounced fill-its) are wide beads of epoxy that are carefully shaped into the inside of each of the joint. 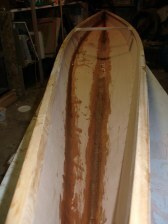 This is the "glue" part of "stitch and glue" boat building. 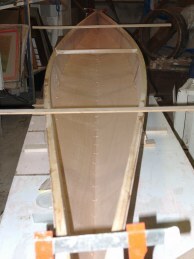 As shown above, two long pieces are placed across the boat four feet in from the bow and stern. Then you crouch down a few feet beyond the bow and sight down the boat to make sure the two pieces are parallel to each other. Also I put some clamps on the bow and the stern in various places so that they would assume the proper shapes. Next I cut three long pieces of fiberglass tape to run along the inside of each seam. I also cut a section of fiberglass cloth that fit the shape of the bottom panels in the cockpit area. 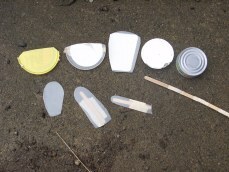 Last but not least, I made some tools for spreading and shaping the fillets (see below), mostly out of old plastic milk jugs (backed by popsicle sticks for support). I made a curved edge of a different radius on each so I could create a whole variety of shapes depending on the angle made between the two panels being glued. Then I was ready to get down and dirty. I made "thickened" epoxy by adding wood flour (which is essentially pulverized wood chips) and a little Cab-o-sil until I had a paste the consistency of peanut butter (smooth not chunky). I did it in three or four batches using around 36 oz. in all (you could do it in one batch but I kept underestimating how much more I needed) . Above left: It was a messy operation as you can see. The trick is to not spread too much (so as not too add too much weight) but not too little either (so it will still be strong). Hopefully I struck the right balance. The booklet said that your fillets should be at least as thick as you plywood so I tried to stick to that rule of thumb. Above right: Two out of three seams done.